SystemTap is a powerful tool for investigating system issues, but for some SystemTap instrumentation scripts, the startup times are too long. 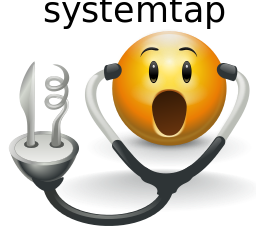 This article is Part 1 of a series and describes how to analyze and reduce SystemTap’s startup costs for scripts. The first thing that stands out is the peak at 243 (strace.stp) is approaching 90 seconds of overhead to start. The strace.stp script instruments every syscall entry and exit, resulting in a large number of probes and associated code for those probes. The peak at 195–196 for errsnoop.stp also has the same cause. The peak at 203 is due to ltrace.stp instrumenting many functions in the shared libraries used by the monitored user-space application. This creates instrumentation for 545 probe points. The peaks toward the right of the graph at 300 and 301 are for qemu_count.stp and are caused by using SystemTap wildcards to instrument all the QEMU probe points. On the x86_64 RHEL machine that the measurements were being made on, there were over 10,000 probe points being instrumented because of QEMU emulation for many different processors installed on the machine, such as SPARC, MIPS, and PowerPC processors. The peaks at 122 to 125 for hw_watch_addr.stp and hw_watch_sym.stp and at 264 to 267 for ioctl_handler.stp and latencytap.stp are unusual, as they spent more time in code generation (pass3) than most scripts. This is because these scripts are being generated with the SystemTap --all-modules option, which pulls more debugging information into the instrumentation to allow the script to map addresses for modules back to function names. Reducing the startup overhead for the example scripts is a work in progress, but there have been some improvements over the past month for several of the scripts that instrument each syscall. The syscall_any and syscall_any.return probe points are available in the newly released SystemTap 4.0, which will be discussed in an upcoming Red Hat Developer article. 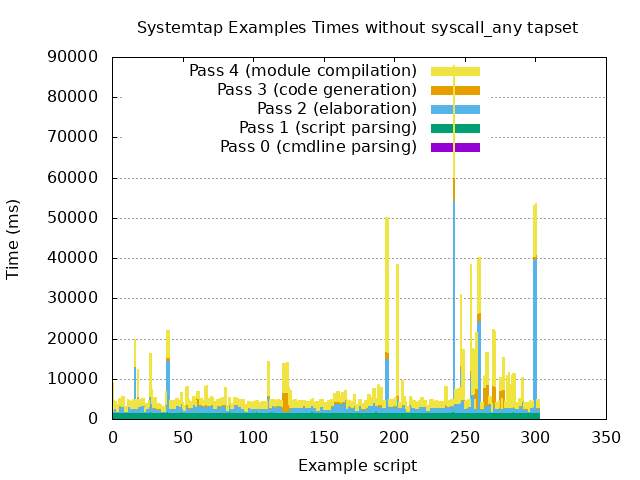 Below is a graph of the example script times with the patches implementing syscall_any removed. There are peaks in the graph below at 17 (eventcount.stp), 40 (stopwatches.stp), 111 (syscallbypid-nd.stp), 250 (thread-business.stp), 255 (container_check.stp), and 256 (errno.stp) that are not in the graph above, which used the syscall_any tapset. This simple graphing of the example script startup times gives us a quick indication of the overhead for the various example scripts and some visual clues of what phases of the instrumentation generation are more costly.